Along with our Custom Graphic Roller Shade products we now offer a complete line of Solar Screen and Blackout Roller Shades. Protect your business from the Sun’s harmful rays, eliminate bothersome glare, and keep the heat out of your work environment. And lower your energy bills in both Summer and Winter! All SolarPro Roller Shades are fabricated with the best components and most popular shade fabrics available today. In addition, just like our Custom Graphic Roller Shades we are here to help you through the entire ordering process from measuring to installation. Our goal is to insure that your shades will fit well, work well, and perform to our high standards. 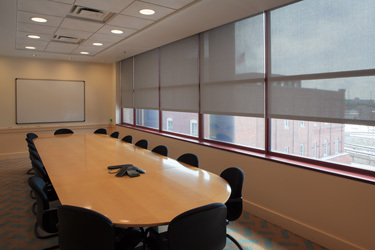 With over 30 years of experience in the window shade business, you can be assured of superior products and service along with our direct business to business pricing. Look over our selection, fill out our Quick Quote and Measuring Guide and we’ll get the ball rolling with a return quote for your shades within 24 hours.